It started early with homemade breakfast – thanks Dennis and Cara Lyn, the freshly baked orange glazed danishes were lovely. 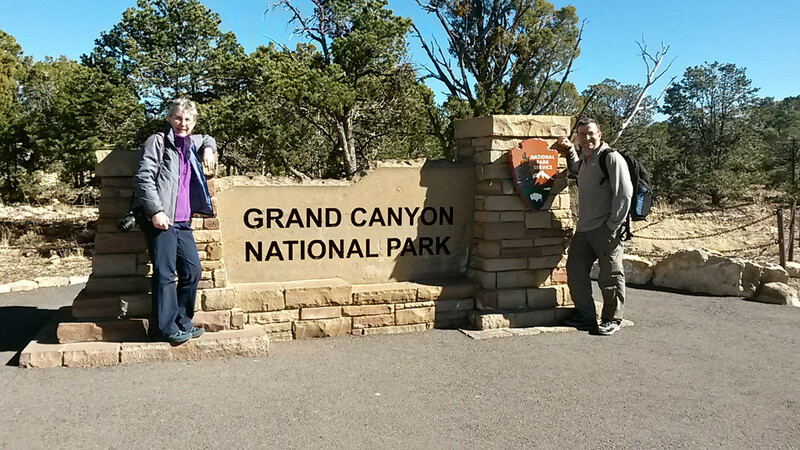 Dennis put together a packed lunch for us and we were off north towards the Grand Canyon. The weather was bright and sunny, although cold and windy early on. Later in the day it warmed up considerably and felt more like a late spring day than mid February. It was unseasonably warm – while the Eastern parts of the US were under feet of snow and unseasonably cold. It is always great having a local guide as you get far more under the skin of a place. We learnt about the area: the geology, topology, economy, people and history. 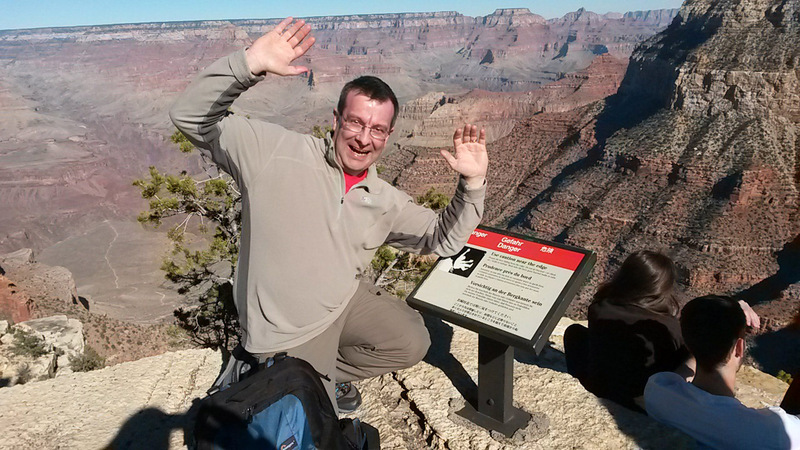 Dennis’s in-depth knowledge of the Canyon, and the best ways and times to explore it were put to good use. We explored anti-clockwise to avoid the crowds for most of the day. We started at the tower. 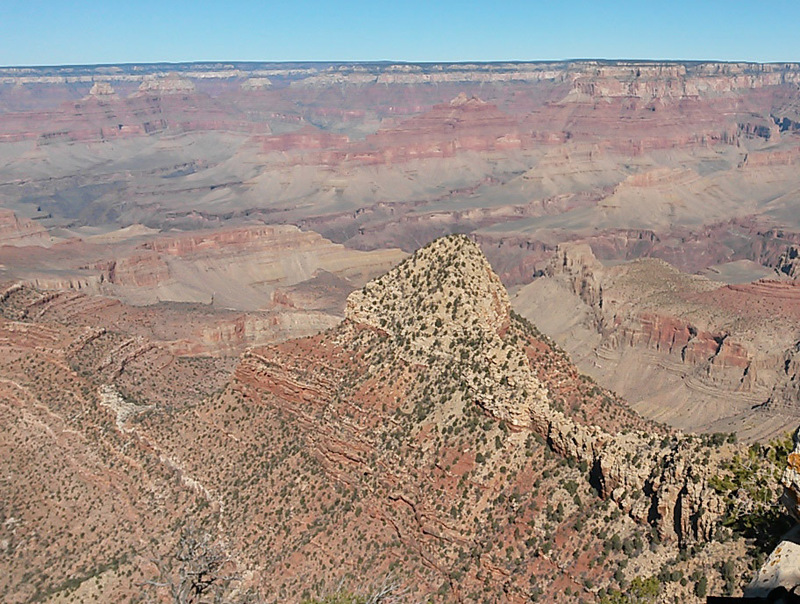 Nothing quite prepares you for the majesty and sheer scale of the Canyon. The tower provided excellent views (and shelter!) as well as history of the area and its peoples. The reflectoscope was particularly interesting (lots of good physics there!) – the colours were much richer in the reflection. and the views just kept coming…. 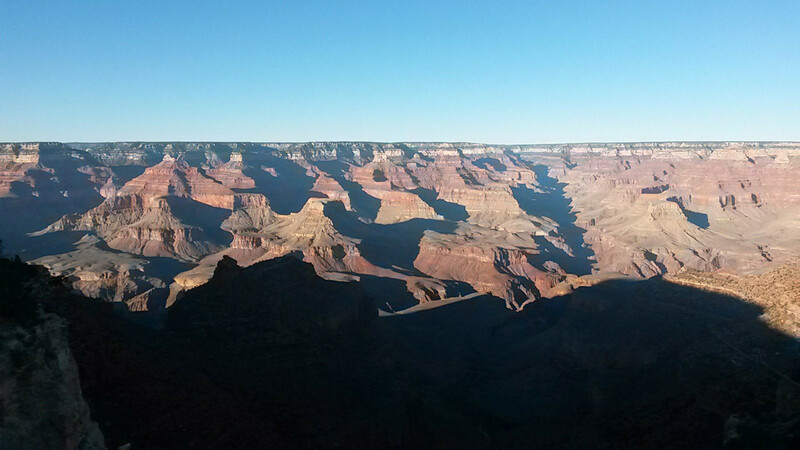 We ended the Canyon trip with a meal at Bright Angel Point while watching the sun set. Venus and Jupiter gave a flashy display too. Could it get any better? And so back to Flagstaff….. But it was clear so there was the opportunity for yet more wonders – this time heavenly. 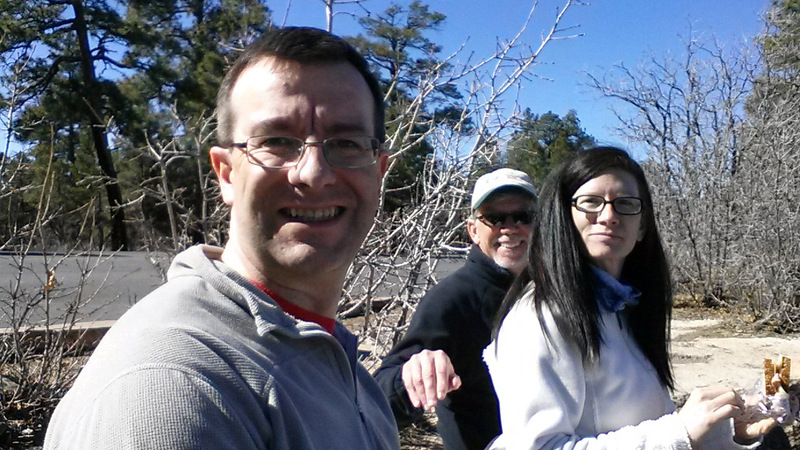 A trip to the Lowell Observatory. It was great to see an Observatory working so hard to engage the public, and obviously succeeding. The car park was full when we arrived, and all ages were present. We were treated to some observing with 3 scopes: 2 dobsonian scopes and a Cassegrain. In the 12 inch Cassegrain scope we saw Jupiter and its moons. If I’m honest I was rather underwhelmed by the view – the definition seemed poor and I’ve seen better with my own smaller scope. Through the smaller dobsonian (~12inch?) we saw Andromeda. Here I got into trouble. I always view with my glasses off so did the same and refocused, I was told off for moving focus! (maybe not the most encouraging way to do outreach!). 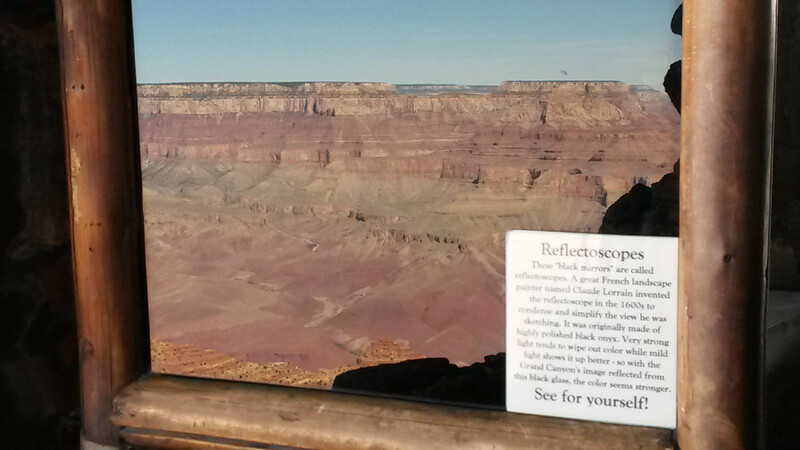 The views from the largest Dob (>20inch) were however spectacular. I’ve never seen the ‘wings’ of the Orion Nebula extend so far, or the trapezium stars been so far separated. Lovely! On our second visit I asked if we could look at the Double Cluster and the lad running this scope was very obliging (exactly the right attitude for outreach) and found the cluster and changed to his lowest power eyepiece to frame the clusters nicely. I love the double cluster, and this view was one of the best I’ve seen. As well as observing we wandered around the exhibitions. 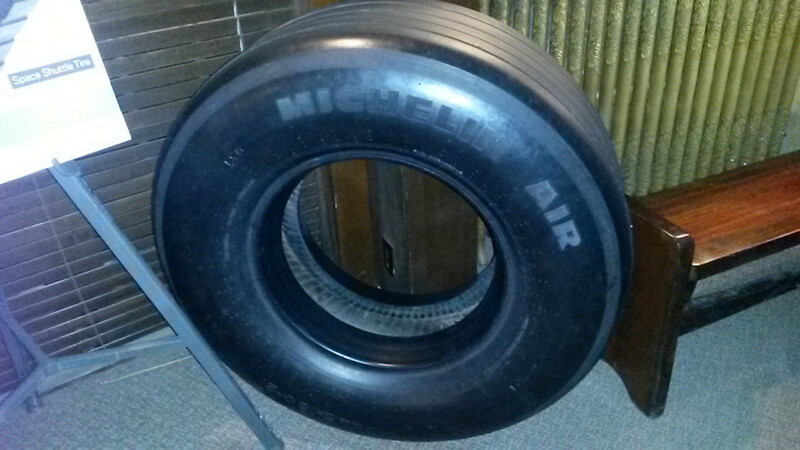 Here’s a tyre from the Space Shuttle (part-worn, used only once). But what was most interesting was reading about the discovery of Pluto at the observatory, and being able to blink the actual plates from which the discovery was made. Finally we looked around the gallery which contained aerial photos and were able to show Cara Lyn and Dennis exactly where we lived. Finally back home for a large mug of tea and bed. A long but excellent day!